Sweet Caroline reverse layout 60ft x 10ft Widebeam is a stunning liveaboard opportunity (MOORING CURRENTLY AVAILABLE at Ivinghoe (1 mile from Cheddington Station, subject to separate arrangement). 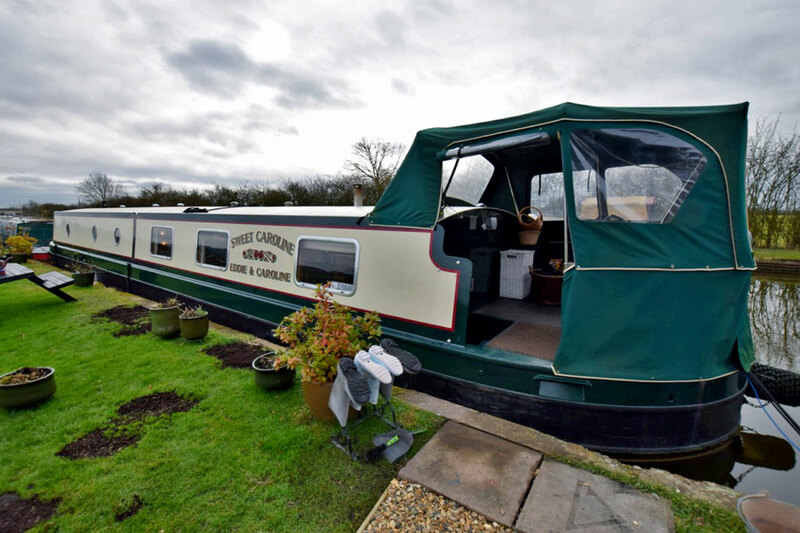 Sweet Caroline reverse layout 60ft x 10ft Widebeam combines the extra width over a narrowboat, and the canal-cruising comfort of less than 12’ wide! Built by Northwich Boat Co / Elton Moss, she is only 6 years old, and with the same owners from new, has been so well looked after. The very large cruiser stern (housing the engine with only 127 hours on it!) is protected by a very good condition pramhood. Very easy access leads into the very stylish and spacious galley. In here is to be found the domestic size fridge, freezer, microwave, gas cooker with extractor fan & light over, and ample storage alongside a breakfast bar with two stools and spacious work surfaces. The saloon follows housing a solid fuel stove, a huge L shaped sofabed arrangement, 32” TV (with Freeview and satellite) and a side hatch. The room is large, light and very spacious. The starboard corridor leads firstly to the office / single cabin. A really well thought out room with lots of storage space (including a wardrobe), a good sized L shaped desk, and a single bed with pump out tank under. A modern & stylish bathroom follows; quadrant shower with ceramic tray, a brace of loos (pumpout & portapotti), a ceramic sink over oak cabinet, a washer / dryer and good cupboard space. All with room to move! On into the master bedroom in the forward cabin. A huge double bed is the centrepiece (with storage under), and there are also two large wardrobes (which also have shelving options), a wall mounted TV, and views from bed through the oak double doors leading out onto the well deck. The central heating is Webasto diesel fired, hot water is via immersion, Webasto or engine, and on board 240v is from landline or the inverter. Lighting is LED throughout. The beautiful woodwork is oak faced ply or solid oak trim with buttermilk painted panelling. Sweet Caroline reverse layout 60ft x 10ft Widebeam is a perfect home and, to reluctantly use the phrase, a rare opportunity with a fabulous mooring (see video)!